We just got back from an exciting week in Boston at INBOUND 2014, so we thought there would be no better subject matter for infographics than on inbound marketing and sales. As you might guess, the conference was all about how to utilize inbound marketing for your business to increase the quality of leads to turn them into sales. It was a fun week full of inspiring speakers, thought-provoking educational talks, hands-on lessons, and social happy hours. Since we're feeling so inspired on the topic of inbound, we rounded up 5 of the best infographics on how B2B sales has changed since the advent of inbound. Today's buyers might be anywhere from 66-90% of the way through their sales journey before reaching out to a vendor! 54% of B2B buyers begin the buying process with informal research around business challenges. Face it; Outbound is out. 2/3 of Americans are on the do not call list and 86% mute the TV or skip ads when watching. Inbound is in. 63% of social media users feel consumer ratings are #1. 90% of people believe brand recommendations from friends and 70% believe consumer opinions. This basically means that people trust strangers over advertisements. 86% of online retailers in the US own a Facebook fan page. Inbound marketing is a cost effective and proven strategy which relies on marketing your website with tools like blogs, social media, SEO, PR, and lead nurturing emails. Companies that blog have 97% more links to their website. With outbound marketing, the average cost per lead is $373.00. With inbound marketing, the average cost per lead is $143.00. Content is marketing's last (well, one of the last) opportunities for creativity. 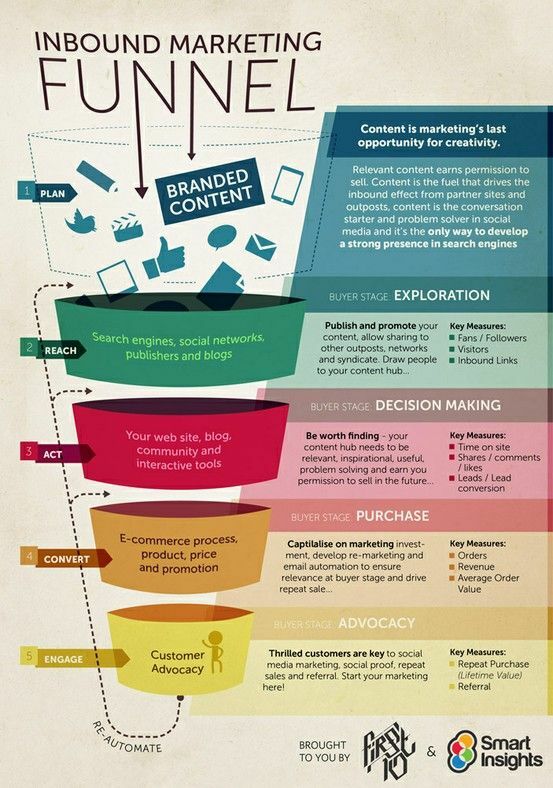 The second stage in the inbound marketing funnel is exploration. The buyer uses search engines, social networks, publishers and blogs to find your content and follow/like your page. This draws people into your content hub. The third stage is decision making. This is the magical place where leads turn into conversions and more time is spent on your site. The fourth stage is the purchasing process, and the final stage is focused on customer advocacy. The last step is in my opinion the most important. This is where you turn apathetic customers into thrilled customers who want to share and spread the word about the amazingness of your product or service. Traditional marketing techniques involve outbound efforts such as ads, commercials, and other media that interrupts. Inbound marketing instead focuses on targeted techniques such as content creation, search marketing, and social media. Inbound marketing is not a one and done thing. It requires constant care and feeding in order to nurture your customers and keep your business growing.